ABAKALIKI, EBONYI (DAILY POST) -- The leadership of the Movement For the Actualization of the Sovereign State of Biafra (MASSOB) on Friday condemned the closure of the Lagos Trade Fair market which it said belongs to the Igbo, by the Lagos state government. The group made this known through a press statement signed by Comrade Edeson Samuel, its National Director of Information, and made available to journalists in Abakaliki, the capital of Ebonyi state. MASSOB blamed a former governor of Lagos, Asiwaju Bola Tinubu for the development. The statement reads: “It is very unfortunate that the international market built by Ndigbo with their money and economic prowess has been taking over by Lagos state government backed by Ahmed Bola Tinubu, who recently and eloquently manifest himself as a core hater of Ndigbo and Christians in general. 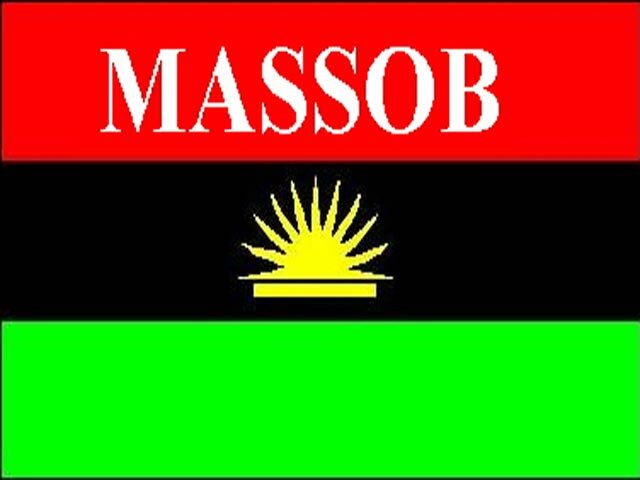 “MASSOB wishes to remind federal government of Nigeria and Lagos state government that the market and business premises built by Ndigbo had an agreement under leasing which will last for 99 years. “Does it mean that the government in power has forgotten this agreement or is it another means of punishing Ndigbo because they voted for PDP and Alhaji Atiku Abubakar and Mr Peter Obi? “It is time for Yoruba leaders to speak out against this evil machinations organized by former Lagos state governor and APC chieftain Bola Tinubu on the people of Biafra. “MASSOB is calling on Ndigbo living in Lagos to think home and also invest at home. Our people should be conscious of their future existence in Nigeria and stop buying land and building houses in Lagos and Ogun state, Ndigbo must stop investing their wealths in unacceptable and unappreciative people and their lands with immediate effect because the security of their lives and properties are not guaranteed. “MASSOB wondered that if MC Olo Omo who is now elected member of house of Representative in Lagos state can use thugs to attack Ndigbo and their businesses in Lagos state with the backed up of Bola Tinubu just because of their political alignment, what then will be the faith of Ndigbo if this kind of man is sworn in as a member of House of Representative. “MASSOB is also calling on Ndigbo to relocate all their businesses and investment back to Biafra land because a bird at hand is worth two in the bush. “MASSOB also warned our oppressors that there is a limit to human endurance, they should stop pushing Ndigbo to the wall,” it stated.